Astronomers have detected cold streams of primordial hydrogen, vestigial matter left over from the Big Bang, fueling a distant star-forming galaxy in the early Universe. Profuse flows of gas onto galaxies are believed to be crucial for explaining an era 10 billion years ago, when galaxies were copiously forming stars. 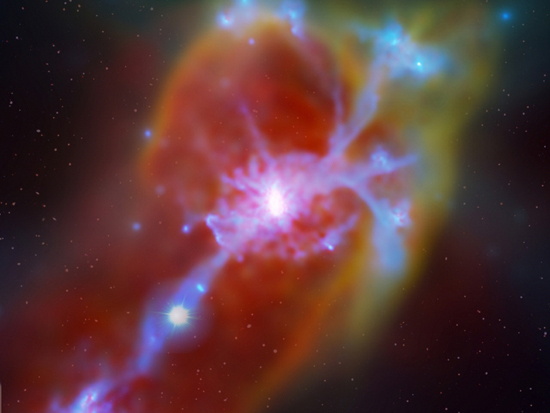 To make this discovery, the astronomers – led by Neil Crighton of the Max Planck Institute for Astronomy and Swinburne University – made use of a cosmic coincidence: a bright, distant quasar acting as a “cosmic lighthouse” illuminates the gas flow from behind. The results were published Oct. 2 in the Astrophysical Journal Letters. The systematic survey of absorption systems comprises observations with the Large Binocular Telescope and from data taken with the W. M. Keck Observatory’s HIRES echelle spectrograph installed on the 10 meter Keck I telescope on the summit of Mauna Kea. The foreground galaxy was discovered by Charles Steidel, Gwen Rudie (California Institute of Technology) and collaborators using the Keck Observatory’s LRIS spectrograph on the same telescope. In the current narrative of how galaxies like our own Milky Way formed, cosmologists postulate they were once fed from a vast reservoir of pristine hydrogen in the intergalactic medium, which permeates the vast expanses between galaxies. Approximately 10 billion years ago when the Universe was one-fifth its current age, early proto-galaxies were in a state of extreme activity, forming new stars nearly one hundred times their current rate. Because stars form from gas, this fecundity demands a steady source of cosmic fuel. In the past decade, supercomputer simulations of galaxy formation have become so sophisticated that they can actually predict how galaxies form and are fed: gas funnels onto galaxies along thin “cold streams” which, like streams of snow melt feeding a mountain lake, channel cool gas from the surrounding intergalactic medium onto galaxies, continuously topping up their supplies of raw material for star formation. However, testing these predictions has proven to be extremely challenging, because such gas at the edges of galaxies is so rarefied that it emits very little light. Instead, the team of astronomers systematically searched for examples of a very specific type of cosmic coincidence. Quasars constitute a brief phase in the galactic life-cycle, during which they shine as the most luminous objects in the Universe, powered by the infall of matter onto a supermassive black hole. From our perspective on Earth, there will be rare cases where a distant background quasar and a stream of primordial gas near a foreground galaxy are exactly aligned on the night sky. As light from the quasar travels toward Earth, it passes by the galaxy and through the primordial gas, before reaching our telescopes. The cosmic gas selectively absorbs light at very specific frequencies which astronomers refer to as “absorption lines”. The pattern and shape of these lines provide a cosmic barcode, which astronomers can decode to determine the chemical composition, density, and temperature of the gas. Using this technique, a team of astronomers led by Neil Crighton (Max Planck Institute for Astronomy; now at Swinburne University of Technology, Melbourne) has found the best evidence to date for a flow of pristine intergalactic gas onto a galaxy. The galaxy, denoted Q1442-MD50, is so distant that it took 11 billion years for its light to reach us. The primordial infalling gas resides a mere 190,000 light-years from the galaxy – relatively nearby on galactic length-scales – and is revealed in silhouette in the absorption spectrum of the more distant background quasar QSO J1444535+291905. A crucial element of their discovery is the detection of the spectral signature of cosmic deuterium, a stable isotope of hydrogen (with an extra neutronin the nucleus). Cosmologists have demonstrated that hydrogen and helium and their stable isotopes like deuterium were all synthesized just minutes after the Big Bang, when the Universe was hot enough to power nuclear reactions. All heavier elements like carbon, nitrogen, and oxygen were created much later in the hot nuclear furnaces of stars. Because the hostile physical conditions in the centers of stars would destroy the fragile deuterium isotope, the discovery of deuterium in the gas confirms that the gas falling onto the galaxy is indeed pristine material left over from the Big Bang. This discovery of this system is part of a large survey for quasar sightlines which pass near galaxies, which is coordinated by Joseph Hennawi, the leader of theENIGMA research group at the Max Planck Institute for Astronomy. The astronomers’ long-term goal is to find about ten similar examples of these cold flows, which would allow for a much more detailed comparison of their observations with the predictions of numerical models.